Let’s remember Wales’s victory over Belgium for the twenty minute period after Nainngolan smashed in that drive. When rather than capitulating or panicking, Coleman’s side played some of their best football of the tournament. They passed and moved – and with both wingbacks pressing high up the park wherever possible – they played. This was beyond. Beyond the reasonable and the likely and quite possibly beyond even the expectations of their myopically magnificent supporters. And yet it was foreseeable. Wales – the team with arguably only three genuine international players – doing an Italy or a Spain or a Croatia. Playing confident, skilled, rhythmic football in a tournament; going right past doggedness and defiance into mature, composed, attacking tournament football. For the manager and the fans this was a dream, yes – but it was also a culmination, or (as this story is not yet done) a consequence. This team had (has!) a pattern they understood, not just the much-vaunted and essential togetherness but a pattern. This fella Coleman (that many of us have never rated, hugely, that has shown no real signs of the genius and understanding that we now have to credit him with) has drilled and instilled something authentically kosher into his posse. Wales know what they’re doing – with and without the ball. This isn’t to say that they don’t have the occasional lapse. There were horrendous moments when defenders both central and wide simply did not know where their oppo’s were: even the towering and inspiring Williams was guilty of this. Similarly the concession of four rank yellows for offences that were criminally unnecessary smacks more than a little of non-elite awarenesses. So there is very much that possibility that they may get found out. I may divert briefly here. Because I have a wild theory that often, actually, international football is not played at a hugely high standard. This is no way to either undermine or demystify the achievement of Wales (or previously Denmark or Greece) or anybody else. Clearly much of the romance of the Euros or the World Cup is about precisely this roaring after opportunities. I love that. But in this tournament, for example, I may argue that only Germany are playing all over at such a patently higher level than (say) Wales that we might expect them to confound even the wonder that is Welsh togetherness and organisation. Consequently – now – Wales are, as Coleman has been at pains to emphasise ‘really here to compete’. Legitimately and with real hope. That hope re-doubled last night in Lille. With the result, and with the manner in which Coleman’s team applied themselves. Broadly, the triumph of last night was about Wales’s comfort within their plan. They read the moment, gathered and they flowed forward. All this is general. The 5-3-2 system morphing into a 3-5-2 in possession, with Bale allowed or expected to roam (and then race forward). The stout narrowness in defence, challenging the Belgians to conjure something extraordinarily laser-like from out wide. The conviction that neither Hazard nor anyone else can score from the wing. The epic numbers of shutouts and blocks in central positions. Simple but clearly beyond execution for the England’s of this world – and yes that IS relevant to the Welsh psyche, it being powerfully valedictory for Dai and Gareth and Lleuci that England’s weakness contrasts so gloriously sharply with Welsh tightness and brotherhood. Lukaku R and de Bruyne were marginalised: more importantly perhaps, so was the skipper, Hazard. As the second half wore on, so the overwhelmingly more gifted and favoured Belgians slid from view – or were ushered from the scene, dispirited. That thing where folks *cannot believe* we’re gonna get beat by…. kicked in. Fellaini inevitably had a clear, headed chance but yet again the Manchester United anti-cult doinked it emphatically wide. It felt increasingly fated – whatever that means. Maybe we should note that the first half was pret-ty close to a great game game of footie. And that both sides must take some credit for an open, entertaining 45. Coleman again must be applauded for clearly instructing his wing-backs to get high up the park from the start; many might have been more cautious against a side heavily loaded with attacking threats. In truth I rate this recognition from Coleman that a) Belgium might be exposed by both the real and psychological threat of positivity from deep on the Welsh flanks and b) his *actual commitment* to set up that way as his greatest achievement so far. An obvious alternative from Wales might have been to be essentially defensive but allow Bale to raid and Ramsey to gallop in occasional support. 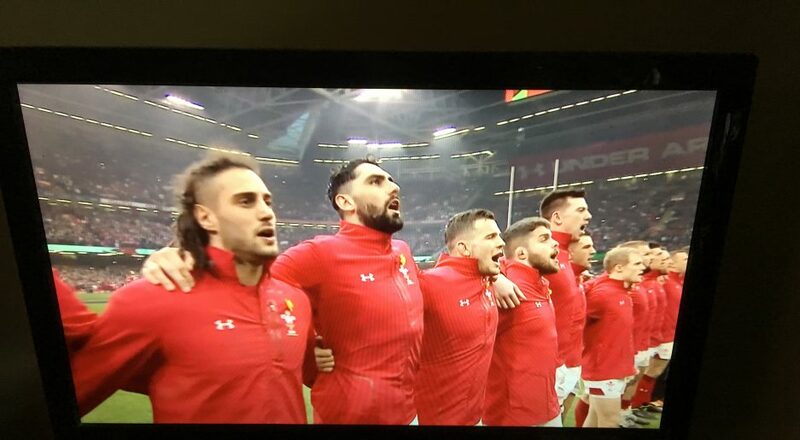 Wales were braver than that. More confident and competent than that. For all the brilliance and powerfully unifying success of the #togetherstronger campaign, maybe its whiff of minnow-ness, of underdog-ness undervalues the Welsh achievement here. Wales (particularly last night, particularly when under pressure) have come out and played. We have to talk about the goals. Goals do everything from pay the rent to raise the roof to change everything. Belgium’s stunning early strike felt like an affirmation of quality and a potentially ‘deadly’ thrust into Welsh hearts. This was bested, however, by subsequent, outrageous interventions. William’s committed header (and celebration in response) was a magical, sub-Tardellian moment – a gift to us all. The skipper and stopper-supreme (okaay, English-born but come o-on) has epitomised something wonderfully blokey and genuine and Welsh in this Big Red Adventure. If you failed to find his post-nod charge to the gaffer and the support team uplifting you must be reading this from inside a coffin. For Robson-Kanu (of all people?) to cap even that with a Cruyffian swivel and prompt despatch confirmed, surely that something major was in the offing – like Judgement Day, for example. The out-of-contract striker is something of a cult figure precisely because of his membership of the Endearingly Honest No-Hoper School of Forwards, so this further moment was one further, improbable step beyond. But not the final one. When Vokes raced on to flick a near-post header across the keeper (and therefore disturb another prejudice about him too, being a non-striking striker) the thing – the universe, the laws of everything – seemed gloriously done in or over or something. Something mad and beautiful. Wales were there and it really was beyond, mun.